Extra Wide Horizontal Address Plaque - - more than 2' wide but only 6" high. 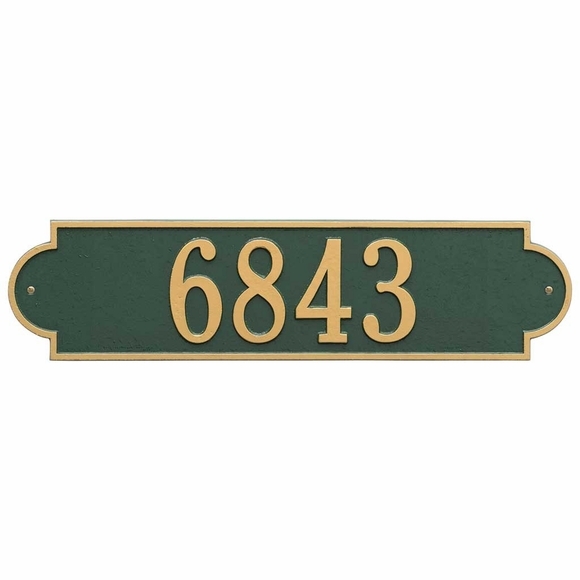 This personalized plaque is designed to hold up to five very tall 4.5" numbers on one line and still fit into a narrow space (for example, centered above your front door). Wall mount. 25"W x 6"H. Made in USA. Rectangular shape with arched ends. The one-line sign holds up to five (5) 4.5" numbers or ten 3" characters. up to twenty-five (25) 1.25" characters on line 2. Please be sure to use the Line 1 input box that corresponds to the sign style you selected. Leave the other Line 1 box empty. Smaller images (from left to right): antique brass, antique copper, black/gold, black/silver, black/white, green/gold, oil rubbed bronze, bronze/gold, pewter/silver, red/gold, and white/gold. Dimensions: 25"W x 6"H x .375". Richmond 25" x 6" personalized address plaque is perfect when your wall space is much wider than it is high. Tall 4.5" numbers are nearly as high as the sign itself. 25"W x 6"H.